“This imaginative reuse of a military building is an effective way of revitalising a challenging site which is completely respectful of the surrounding landscape”, the jury said of this project, which aimed to save an old military fortress from ruin. The private initiative, created and directed by its owner Mr Antonio Obrador, restored and transformed this Fortress, located in a natural protected area into a beautiful hotel, which is completely respectful of the building’s architectural essence and its important environmental surroundings. The Cap Enderrocat Fortress, built in 1898 as part of the defence system of the city of Palma de Mallorca, is the largest fortress of the Balearic Islands. The main buildings alone cover more than 4.100m2 and the entire property an area of 30 hectares along 2 km of coast. Since the end of the Spanish Civil War in 1940, the fortress suffered a slow decline, having been virtually abandoned and disused from the 1980s onwards. The premises suffered serious deterioration due to vandalism. The Fortress was carved, for the most part, directly into the porous limestone and this in turn posed serious structural issues. The renovation was extremely complex due to the sheer size of the Fortress, its national monument status and its protected natural environment. The project was implemented over fifteen years with a strict funding plan in order to guarantee that its new function could be developed in a sustainable way. The result is an iconic hotel which hosts public and private events and cultural activities. There is a real focus on the heritage of the site, with the hotel’s staff having received training in heritage to raise their awareness of its important characteristics. This year, a small museum, to house an important collection of 1,400 photographs from 1910 to 1930, opened to the public. Guided tours of the fortress and its special surroundings can be arranged. 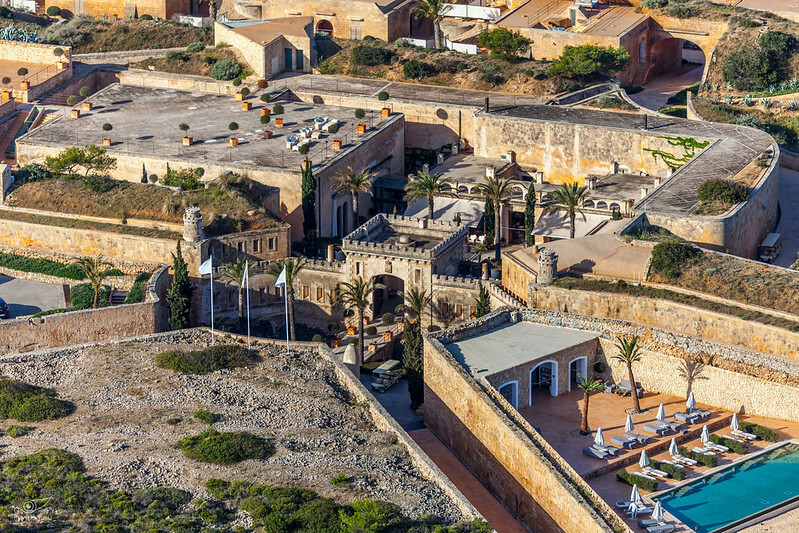 In privatising the building and securing the structure for reuse as a hotel, this project has reclaimed an important part of this island’s military, architectural and cultural heritage and sets an example of what might be achieved in other similar fortresses throughout Europe. “The impressive private initiative which has propelled this project has ensured a soft intervention which is respectful of the building’s existing character. The restoration of this site and its successful reuse is a fine model for similar sites in Europe”, stated the jury.